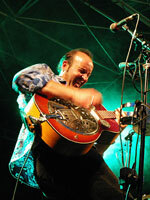 Hans de Vries aka Homesick - singer, guitarist and brilliant harmonicaplayer - is on the road for his music since he was a teenager. He is one of the highlights of the Netherlands not only on the bluesscene where he is a well known act but as well in all New Orleans styles - may it be R 'n' B, Zydeco or whatever it takes to let his audience share some Louisiana heat. As bandleader of his successfull formations he played all the big European stages like the North Sea Jazz, Montreaux or Ascona. At the age of 10 he for the first time saw a band playing in the cantine of his footballclub using old radios as amplifiers. Hans knew this was what he wanted to do ! So, two years later - at 12 - the kid started strumming the guitar and blowing the harmonica. Hearing bron y aur stomp by Led Zeppelin the boy really got lost. After a few weeks of practising he managed to play that song. 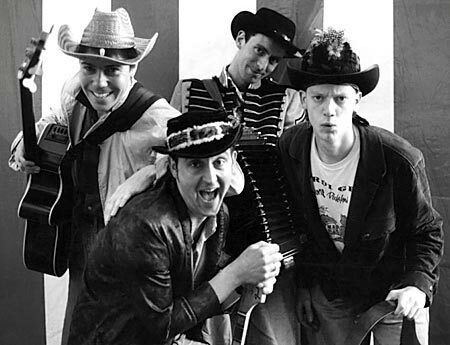 It was not before the family moved to the south of Holland, that Hans started his first band. After a summer's work at the car wash he gathered enough money to buy his first ELK guitar amp. With a drum, bass, keyboard/flute and guitar line up the band Orakel covered almost everything from Hendrix to Led Zeppelin and from Jethro Tull to Ten Years After. "It took another year of carwashing to get a vintage MAC public address amp with two speaker cabinets and some microphones." "i really liked playing rhythm 'n' blues. Remember, the blues was hot in those days. We rehearsed in a youth centre called TRY in the little village of Oudenbosch. At that time there was a hit 'Backstabbers' by the O'Jays. So we formed the Backstabbers, which everyone thought was a real cool name." 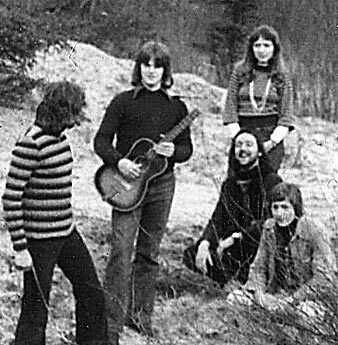 A few years later in 1977 Homesick started studying drama & music in Utrecht and formed another band with the same Backstabber personal. It was called Timshel which means "if you really want something, you can do it". They were playing original material only. So actually he now had two bands running at the same time. 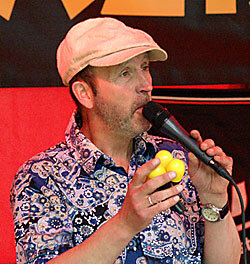 Timshel had a lot of local succes with songs like "Hagelslag" and "Festival", which was a dedication to Europe's first several days' music festival JazzBilzen. Hans then was invited as a singer in a symphonic rockband called Exhibit. There he met John Zwetsloot who was the technician in this band. John became a good friend and a decade later he did the management for Louisiana Radio. 1979: Hans felt he had "to study seriously for a while" which let him end up as Teacher of Drama and Music in 1981 (School of Arts, Utrecht). But though studying in earnest he put up a student band called Billy Beats Johnny. In 1979 they had a big hit in the studentscene with a pop song called "Lenin (was a woman)". And since Hans took studying serious they even made it to the campus of Cambridge, and did some touring in England. Allthough it was just fun to them, people seemed to get inspired by it. They really had a following. Anyway in 1981 while Hans already was working at the Theater Kikker in Utrecht he could arrange some special concerts in the theatre with the rejoined Backstabbers. 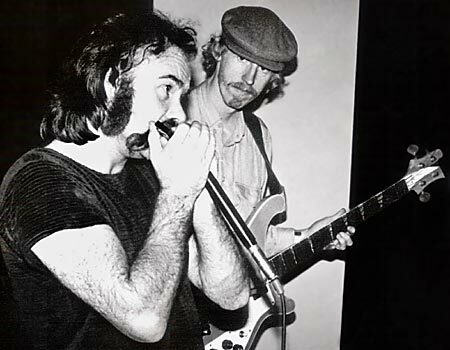 This time with John Zwetsloot on the bass and John Lagrand - "the best harmonica player Holland has ever had". He joined the band for a couple of years and inspired Homesick a lot in playing harmonica himself. 1985 Homesick ran into the great Irish guitar player Martin Hutchinson, who really gave the band a professional boost. Time flew by while they toured all over Europe and stayed for weeks and weeks in Ireland and France. They made 6 albums off which only the latest is still available. Between 1987 and 1991 allthough touring intensly with his own band The Backstabbers Hans even worked as tourmanager for artists like Chris Daniels, Lee Clayton, Chaka Khan, Ronnie Earl and several others. During that time he also performed the opening act for Oleta Adams as solo artist and shared the stage with names like Los Lobos, Willy Deville, Dr John with his band. It must have been around these years that he finally got his nickname "Homesick" which took him some time to adopt. But finally we all know him as Homesick. In 1991 Homesick - still with the backstabbers - was asked to take residency at the newly set up bar "Mad Mick And Big Mamou". With at least one guest musician they kept jamming at Mad Mick once a month till 1997 when the bar was sold. These swamp-sessions run right through till the wee wee hours. 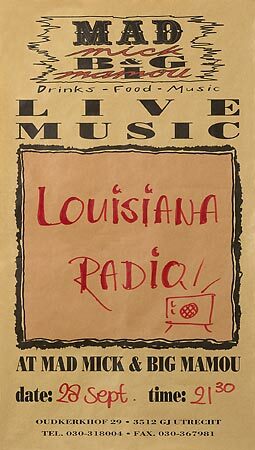 So while Louisiana Radio went on experimenting and exploring southern music back home they did superb live performances all over Europe. The band received an overwhelming reception whereever they played. Apart from playing the clubs and festivals in Holland, Louisiana Radio regularly toured Belgium, France, Denmark, Germany and Switserland. Though they never actually performed in the US they got airplay on WWOZ in New Orleans (!!) while the Jazz Fest was in full swing and hundreds of the world's famous musicians were around. That was spring of 1993. Already 1992 they performed at the prestigeous North Sea Jazz Festival. They had an incredible success. In fact the Radios were so sought after that organizers even wanted to book them for their private partys. 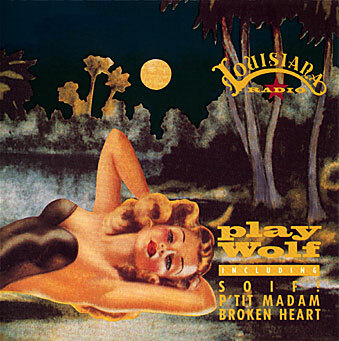 Also in 1992 they released their first album "Playwolf" which was a great success right away. The same year Arend Bouwmeester -saxophones and percussion- who already was to be heard on the Playwolf album finally joined the band. 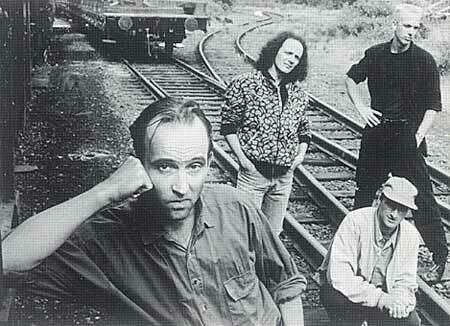 They continued touring and recording with that line up till 1997 when Arend Bouwmeester left the band. That year their album "Four And A Half" was released. Louisiana Radio carried on as the "original" 4 piece formation and did many more fine gigs. On the band's most peculiar album "Variomatic" which was released 1999 Arend Bouwmeester was to be heard again. In September 2000 after almost 10 years of Louisiana Radio and 5 albums and 6 singles they all decided that it was time for a change. Once in a while Homesick works with the one or the other member of his so far most sucessful band again and on very rare ocasions even the band may perform once more, but meanwhile everyone has his own musical projects. Over time what started as occasional performing developed into the trio "Homesick & The Louisiana Men". 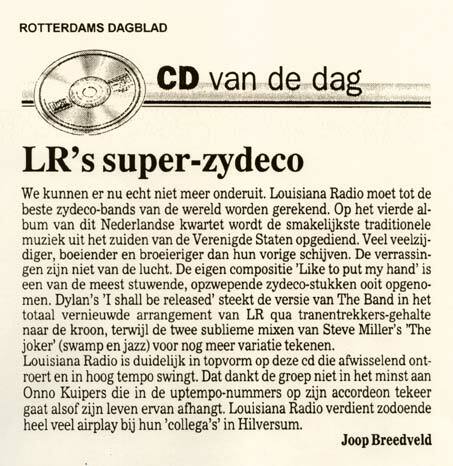 The Louisiana Men are Alex Siegers -percussion, vocals-, a schoolmate of Homesick who was to be heard on most LR records already and Toon Ekkers -guitar,vocals- as well a long time companion and friend of Homesick and guest on the LR records. 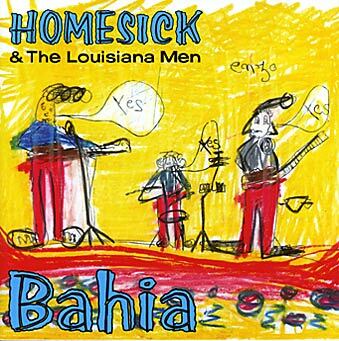 In 2002 the trio recorded their first album live at the Le Bahia in Pornic, France and in recognition of the place Homesick played for 15 years they simply called it "Bahia". Meanwhile they strictly appear as "Louisiana Men" and perform with up to 5 people. They are the personal of Homesick & The Louisiana Men plus Henk de Kat on the accordion and Henk Spies on the bass-saxophone and percussion. A new CD was released in summer 2005 under the title of "Welcome To The Bon Ton Club". "Look man there is all this talent - we must not let it slip away." He takes his new task as a challenge and as serious as his own musical projects. And man am i curious about his newest musical project he didn't want to talk about yet. But you can read about it on this website as soon as Homesick decides it's ready to be announced. Homesick for sure fits into the long line of famous artists who not only got their impressive musical career but are asked and willing to spread their magic and knowledge. "The goal in the end is to keep on playing and rocking."